Beginnings are rough, bumpy, joyful, unfulfilled, catalyzed but not actualized. Beginnings can be hopeful and when in truth unfulfilled, hurtful. Beginnings are whispers of a thing. In this case, this was a failure of a shrine for me. I attempted too much too fast and stressed the initial spark until, without space and air, it went out. 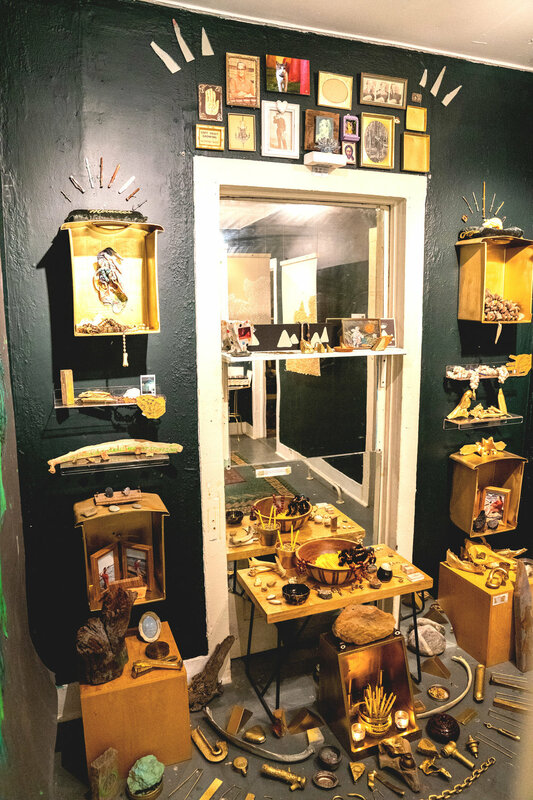 This shrine was a presentation for EAST Austin Studio Tour in November. I was working on the shrine while coordinating the show; as usual attempting too much and I lost my grip on Grace. I did not finish this piece in time for the unveiling at the show so I showed it incomplete; which affected me more than I would have expected. It was an attempt to convey that we have more in common than we do in opposition to one another. It failed. i will try again. Annie Wells is an artist and curator from Austin, TX. An active collector of found objects and creator of site specific installations, she explores and then visually expresses the balance of destruction and creation.